The Australian Banana Growers’ Council is still negotiating detail related to new Water Quality Regulations in Queensland and is hopeful of achieving a practical outcome for growers. The ABGC has provided a submission to a parliamentary hearing, outlining aspects of the proposed regulations that are not acceptable to the industry. The Board has requested meetings with the Agriculture and Environment Ministers to explain to them the complexity of banana farming and the importance of banana growers being able to farm profitably and sustainably. On top of this, CEO Jim Pekin has met with the Office of the Great Barrier Reef to share industry concerns. More details here. You can also read ABGC’s submission to the parliamentary hearing here. As the new minimum industry standards won’t start until July 2020 at the earliest, growers can use the next twelve months to get ‘reg ready’. If you’ve successfully completed the quick and easy BMP Checklist and you have found that you are farming at Best or Okay level practice, it’s likely any new Reef Regulations won’t have much impact on your farming. If you aren’t sure, haven’t completed the Checklist or can’t remember your BMP log in, give Rob Mayers a call. ABGC extension staff are keen to work with you if you need to change your practice to make improvements. Once you have completed your BMP Environmental Guidelines, you will also be eligible to access the BetterBunch record keeping app. This app has been developed specifically for the banana industry and will help you to record your farm inputs – aligning with the “minimum industry standards” and saving you time and effort. Contact Rob Mayers on 0447000203 or Robert.Mayers@abgc.org.au to assist you with both the BMP and BetterBunch. Feast of the Senses needs you! Can you spare an hour or two to help the Cassowary Coast BGA at Feast of the Senses this Sunday, March 31? The Australian Bananas marquee is always a huge hit on Market Day, but it takes many hands to make light work! If you’re able to give up some time, organiser Jo Borsato would love to hear from you on 0417 611 996 or josephine.borsato@lpgroup.com.au. Our deepest sympathies to the family and friends of longtime banana industry advocate Vicky Kippin-O’Connor, who passed away last weekend. A fourth generation primary producer, Vicky was well-respected and well-known in the industry, serving as a Director and President of the Australian Banana Growers’ Council from the late 1990s until 2007. Her funeral will be held at Black’s Funeral Parlour in Innisfail, at 2pm next Wednesday April 3. Since the first detection of Panama TR4 there has been a lot of government, industry and grower activity to manage the spread of the disease. In the past four years, growers have faced many challenges and now Biosecurity Queensland and the ABGC would like to hear how farming in the presence of Panama TR4 has affected you and your farm. We want you to have your say. That way we can make sure we are doing the best job to assist you and the broader banana industry in controlling and containing the disease. The Panama TR4 Program has engaged a fully independent, Queensland-based research organisation—Proof Research—to understand these impacts. Proof Research is contacting growers to ask them to participate in an interview. The interview may take up to one to two hours. All participants and their responses will remain anonymous and the data only used to inform future strategies to benefit the industry. Growers who participate will also be compensated for their time. Did you know that there are various disinfectant products proven to be effective against the fungal spores that cause Panama TR4, when used as part of your cleaning and disinfecting regime? You can also use test strips to help determine whether you need to change your disinfectant more or less regularly. Making some simple changes and monitoring the concentration of your products in footbaths/dips etc. could add up to big cost savings. Check out the Better Bananas website for more information. Celebrating the banana industry is something we do everyday – but on May 1, all of Australia is getting on board! Growers are invited to join the event by sharing their shed selfie – a behind the scenes snap of the people and places that help make bodies sing across the country. Simply take a photo and tag Australian Bananas on Instagram or Facebook, as well as #ShedSelfie. You can also email them directly to Tate.Connolly@horticulture.com.au. More details on National Banana Day soon! 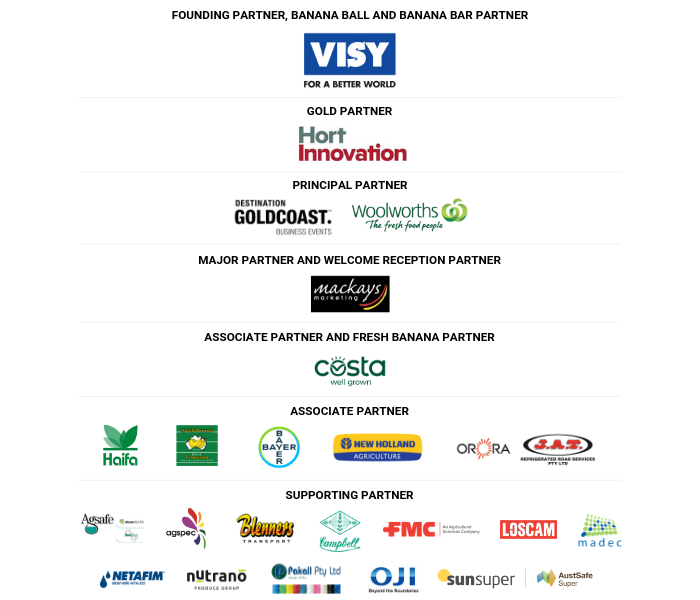 The Australian Banana Industry Congress committee would like to say a big thank you to the fantastic businesses who have come on board to support this great event. Congress would simply not be possible without the contributions made by a range of industry stakeholders. Grants are now available as part of the Smart Farming Partnerships for substantial projects (between $250,000 to $4 million) aimed at supporting sustainable agriculture. Farmers, Landcare groups and researchers are encouraged to apply for the funds, which could be used for a range of projects to help with issues like soil health, pest control and climate adaption.